By Xah Lee. Date: 2010-11-22 . Last updated: 2015-09-10 . This is another interesting design. This is a big improvement from traditional PC keyboard. But isn't perfect. This keyboard offers hardware Dvorak layout. The keys are laptop type of shallow flat keys. This is not good for prolonged heavy typing (such as data entry clerk). The Ctrl key is hard to use. One small one on the left buried with other keys. One larger one but far away on the right, also buried among other keys. This is bad for Emacs users. The Alt keys are nicely positioned, right under thumbs, for both hands. Good for ErgoEmacs users. For GNU Emacs, you can swap Ctrl and Alt. Since you are designing a complete new layout, it'd be better to move this traditional column to the center, and eliminate the 6 keys by pinky. 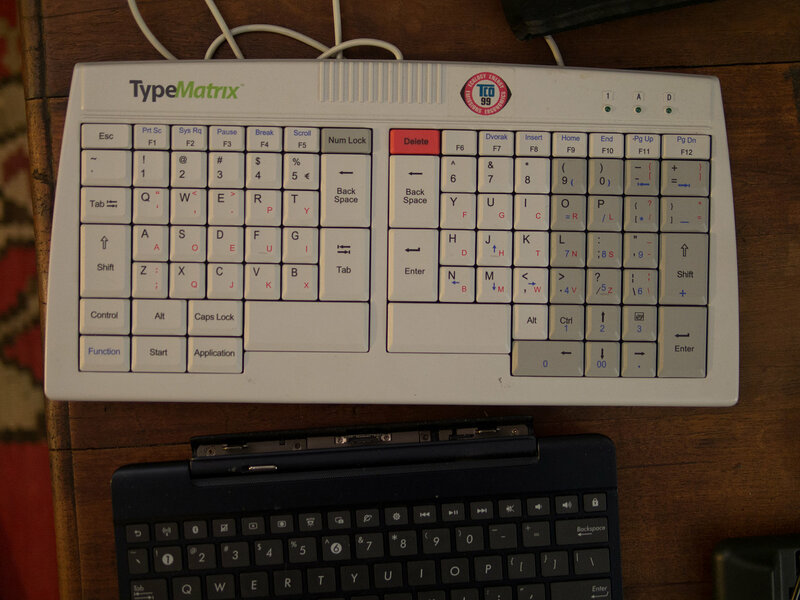 Compared to other ergonomic keyboards, the TypeMatrix is not so good. But if you don't type all day and prefer shallow flat keys, this beats Apple's Aluminum Slab keyboard for sure. A older model, no longer made, is Typematrix 2020. Wider hands separation. In this model, there's about 3 keys separation. In 2030 model, 1-key separation. See: Best Ergonomic Keyboards 2019.